The WinMo-running HD2 was one of the first 4.3-inch phones we ever saw, and straight-away I asked HTC if they would create an Android version. Flip forward a year, and we have the Android-running EVO 4G and Desire HD. With the EVO 4G being a Sprint (and US) exclusive, the Desire HD is aimed at the rest of the world. While I haven't seen the EVO 4G in person (living in the UK), I enviously heard of the stories from delighted users of it, hoping one day something similar would be created for Europe. It may not have 4G speeds, but from my brief session with the Desire HD, it ticks every other box. It's as massive as you'd expect, but every time I hold a phone of that size, I can't help but think it's too much. At least, it's too much for my ladylike hands, but for someone bigger, it could be just right. One of the first things I noticed was that the optical trackpad has been removed. That's certainly no problem, with the touchscreen being so responsive. Will anyone actually miss it? In my review of the original Desire, I commented on the quality of the optical trackpad in comparison to the trackball HTC used to include, but mentioned that I hardly had to use it. It's no wonder it was removed for the Desire HD, lending more room to that glorious 4.3-inch screen. 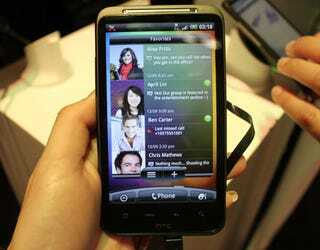 With HTC no longer using AMOLED screens, the WVGA TFT LCD used in both the Desire HD and Z is more than adequate. It's bright, it's decent, but I guess we know there's better elsewhere (looking at the Retina Display here, iPhone 4 readers). The touch-sensitive buttons below the screen are responsive, and helpful—taking you home, to the menu, back or to the search function. There's no doubt that it's HTC's newest flagship (outside of the US), but I can't ignore the lure of that QWERTY keyboard on the Desire Z. If touchscreen is all you need (and your hands are larger than mine), then the Desire HD should definitely be considered.